Let's have a moment of honesty here. These were so damn good that I ate two instead of just the one that I originally planned on. Do I feel guilty? Not for a second. What makes this dish is the sauce. Never had Bang Bang Sauce? Oooooh, you are missing out! I implore you to make this recipe right away. Seriously. Quit reading here and go make the sauce. My mom spent the day with my daughter and I yesterday, scoping out our digs for the 4th of July, and as she was leaving I started to mix up the Bang Bang Sauce. I gave her a little taste, and it was all I could do to keep her from eating it by the spoonful from my bowl. First thing's first. Let's get that chicken cooking. Toss the ingredients for the chicken into your crock pot and secure the lid. Cook on low for 6-8 hours or high for 4-6 hours. While the chicken is cooking, mix up the ingredients for the bang bang sauce. Just dump and stir. Nothing fancy here! Once done, remove the bell peppers and set aside. Next, remove the chicken, onions, and garlic from the crock pot and allow to cool for a minute before shredding. I toss mine into the bowl of my stand mixer on low with the paddle attachment for a few minutes, but two forks would work just as well! Toss the broth out or use it for something else if you want! Combine the carrots and the slaw together. I used up some left over dry broccoli slaw. But, regular slaw would work just as well! Now it's time to start building your wrap! Place half a cup of chicken into each lettuce leaf and top with some of the red bell pepper. 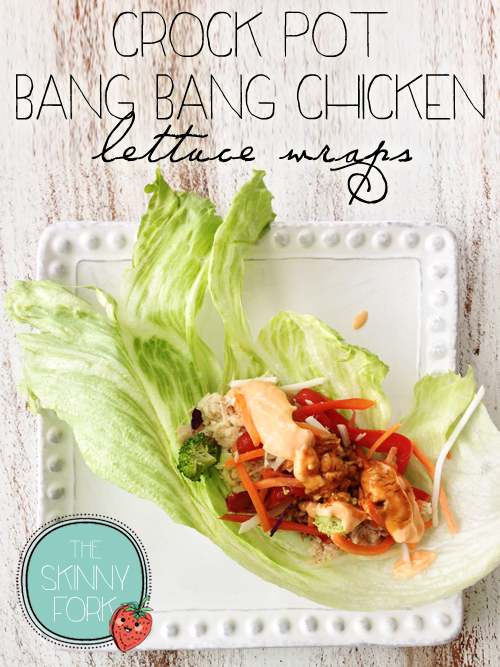 Place about 1/4 c. of the carrot and slaw bled atop each lettuce wrap., followed by 2 tbsp. of the bang bang sauce. Tada! You're done. Add a dash of reduced sodium soy sauce if you wish and enjoy!